We are showcasing Memory Box Products this week. You don’t have to use them to join in but if you have them we would love to see them used. I have an announcement to make. 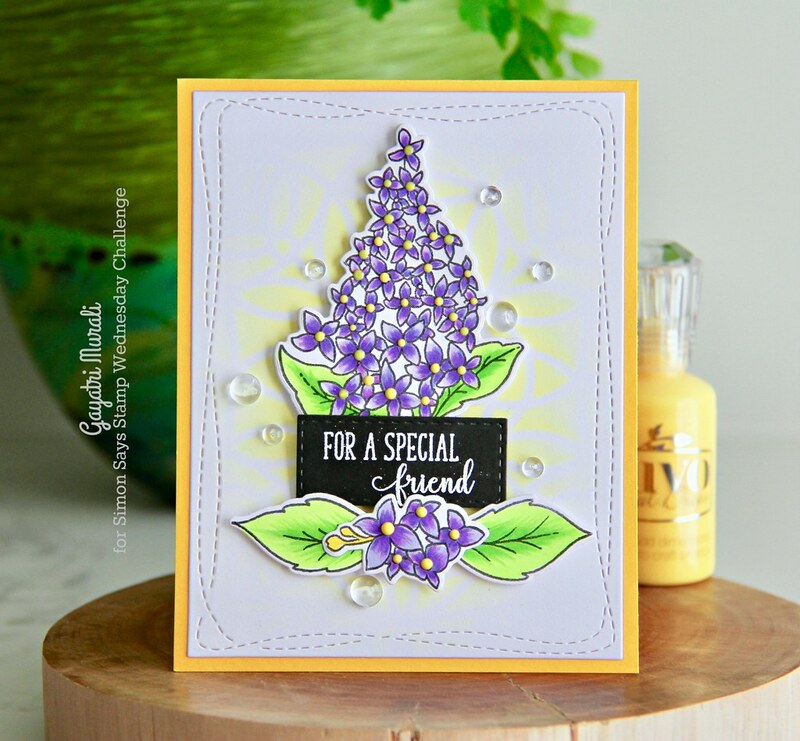 This is my last challenge as design team for Simon Says Stamp Wednesday Challenge Blog. I am stepping down from the commitment. So sad to go but it is time. I have really enjoyed my time as DT for the challenge blog. Great team, wonderful challenge that pushed me to think outside the box and wonderful support system. Always thankful for having me in their team. 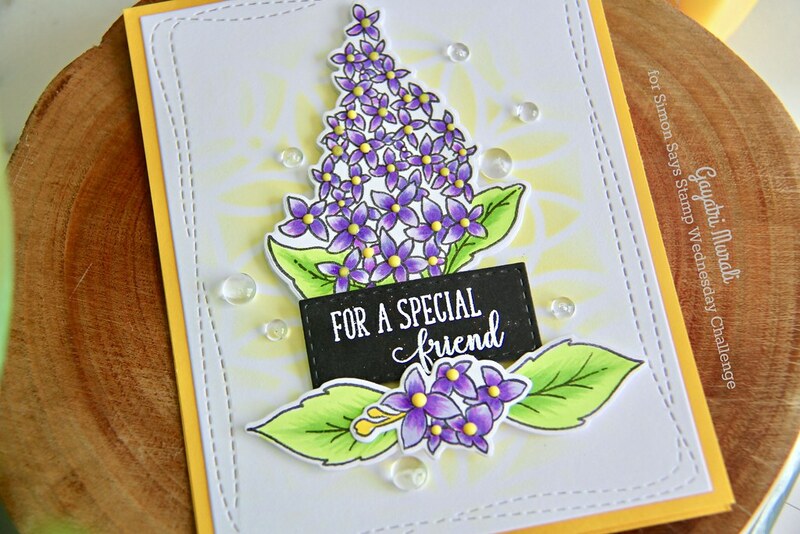 So for the my last challenge, I have used Memory Box Spring Lilac stamp set and coordinating dies to make this card. I stamped the images from Spring Lilac stamp set on Neenah solar white cardstock using Simon’s Intense Black ink. Then I coloured them using copic markers. Using the coordinating dies, I die cut them out. ON the centre of the lilac flowers I added Nuvo crystal drops in glossy yellow and left them to dry. I die cut neenah solar white cardstock using the largest of the Wonky Stitched rectangle die from Simon. Using the Marilyn stencil from Simon, I sponged Squeezed Lemonade distress oxide ink only on the centre fading out. 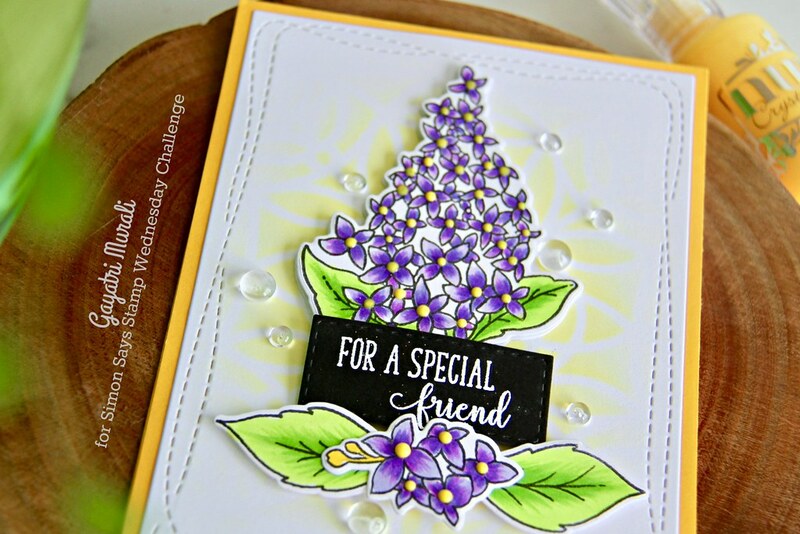 The sentiment from the Spring Lilac stamp set is white heat embossed on black cardstock and die cut using the smallest stitched rectangle die from Simon. I made a cluster of the die cut images and sentiment and adhered it to the sponged white panel using foam adhesives. The entire panel is adhered on Sunshine cardstock base from Simon Says Stamp. The yellow base picks the yellow nuvo crystal drops on the centre of the flowers as well as the yellow sponged background and brings the card together. I added a few Clear Droplets to the card front to finish off the card. Love the spring colours on this card. Officially for the northern hemisphere it is spring from tomorrow, right? For me it will be autumn. I love both these seasons. All the supplies used to make this card is listed below. If you like to pin my card on your Pinterest board, here is the image. Thank you so much for your support. Have a lovely week! Gorgeous card Gayatri 🙂 the flowers are so pretty and I love the stencilled background and how you popped the sentiment in there, the black panel with the white heat embossed sentiment looks FAB! I love the yellows mixed with the traditional lilac colors, Gayatri – such a happy card! Wishing you all the best – we will miss your beautiful designs! It’s always sad to see such creativity leaving a team but hopefully you will continue creating and blogging. You do amazing work! We will totally miss not having you on the Wednesday team, but I know we will keep in touch! 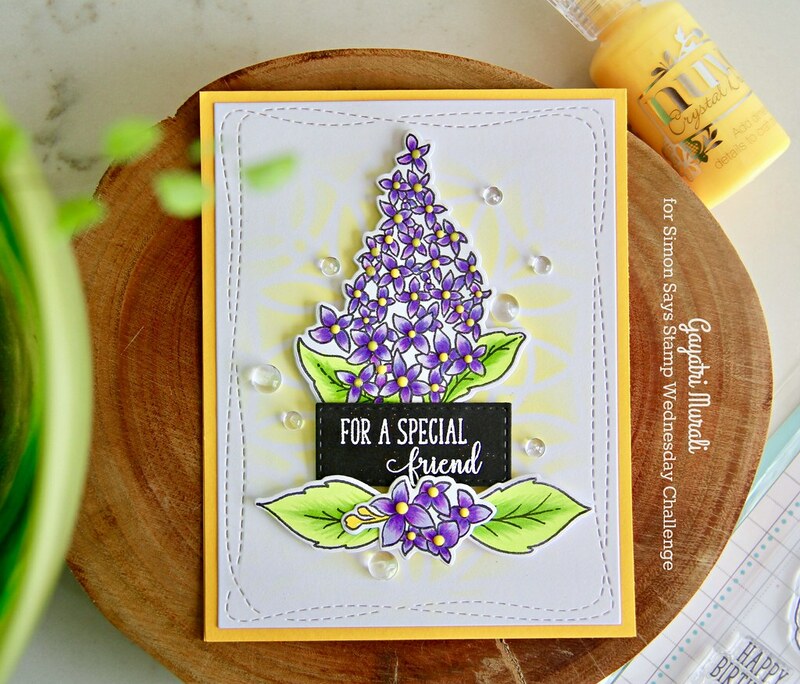 This card is lovely… I just love lilacs and I love the way you blended a happy sunshiney background for it!